Group Gordon’s Jordan Friedman discusses NASA’s scrapping of an all-female spacewalk and the best ways to manage a disappointing announcement. Last week NASA announced the cancellation of its planned first all-female spacewalk due to a lack of enough spacesuits in the right size. The internet quickly erupted in anger and memes ridiculing the stumble. Even Hilary Clinton weighed in. Announcing unpopular news opens any organization to criticism. But could NASA have done anything more to ease the pain? The first step when addressing a difficult situation is to provide a thoughtful and thorough explanation. In its press release, NASA provided little information about what happened, which allowed people to make negative inferences. Instead, they should have provided a detailed explanation of why it was not possible for the spacesuit safety testing process to be accomplished in time for the mission. NASA should have also explained that while the mission would have been historic, safety is the first and foremost priority when sending any person into space. A thorough explanation makes it more difficult to trivialize difficult decisions. The next step is to share what efforts have been or will be made to prevent a similar incident from occurring in the future. 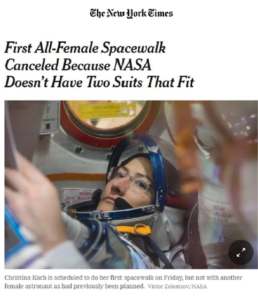 NASA should have detailed any plans to ensure availability of the right spacesuit sizes for future missions, as well as acknowledged and addressed barriers that prevent women from participating in missions. Finally, highlight news about ongoing or new initiatives that demonstrate the organization’s values and take steps to fix the mistake. For example, NASA has several initiatives geared towards promoting women in sciences including Aspire to Inspire, a program that helps young girls find careers in STEM, and SISTER, an initiative that provides middle school students with opportunities to explore nontraditional careers. Mentioning these programs could have helped to illustrate proactive efforts NASA is making to address gender equality. They could have also created a specific initiative in response to the incident, like setting a new goal to recruit and train a certain number of female astronauts. In the face of sharing unpopular news, demonstrating a renewed commitment to your organization’s values can help get you back on track and regain trust. Sharing bad news is unavoidable, but sparking intense public outcry isn’t. By communicating thoughtfully about the issue and its resolution, you can help people understand the reasons for an unpopular decision, demonstrate that you’re taking it very seriously, and reduce the chances that the story gets away from you.